This design rendering, obtained from the agenda packet for the Urban Renewal Agency, shows Summit Creek Capital's proposed design for a new building at 160 Main Ave. S. in downtown Twin Falls. 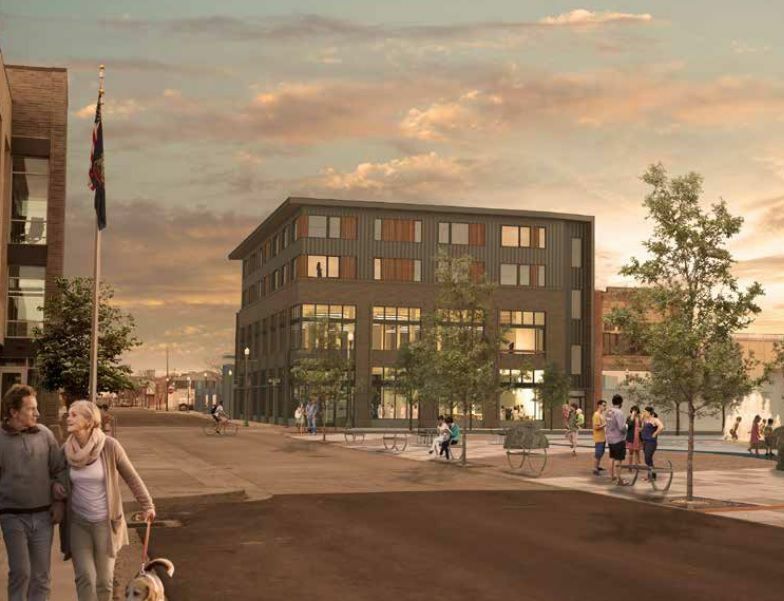 This design rendering, obtained from the agenda packet for the Urban Renewal Agency, shows Summit Creek Capital's proposed layout for a new building at 160 Main Ave. S. in downtown Twin Falls. TWIN FALLS — The old Idaho Department Store building has outlived its functionality, the Twin Falls Urban Renewal Agency decided Monday. 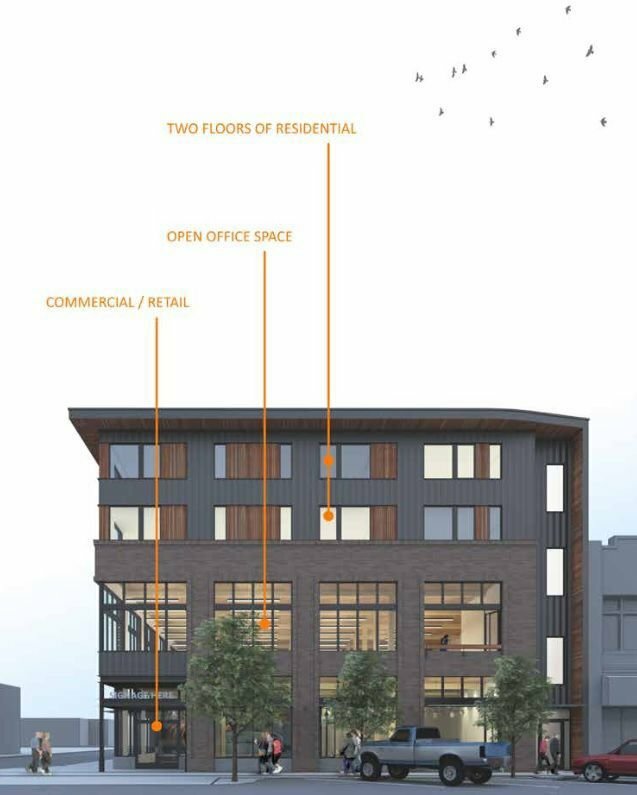 Six of the seven board members voted to support a proposal from regional partners to construct a $5 million multi-use building and parking structure at the west corner of Main Avenue East and Hansen Street East. To encourage development, the URA would demolish the former Idaho Youth Ranch building, sell the property to developers for $100 and pay around $850,000 toward the parking structure. Only one board member, Dexter Ball, favored a second proposal, which would have remodeled the building, but drawn only a $2 million investment to downtown. Still, the nearly unanimous decision wasn’t easy. Board members grappled with parking needs for downtown, nostalgia for the historic building and the overall cost to the URA. Partnering groups Summit Creek Capital, Redstone Development, Pivot North Architecture and HC Co. intend to replace the 1905 structure with a 34,000 square-foot building. It’ll be home to a retailer, two dozen apartments and a business office for 50 employees. “If we want downtown Twin Falls to be vital and vibrant, we need people downtown,” URA board member Cindy Bond said. “I want to see this downtown be vibrant. I want to feel like when I’m in Boise, and that’s where you go for everything. An official agreement will come before the board for final approval at a later time. URA Executive Director Nathan Murray said this was “a really attractive project” and “a first for downtown.” But he and several board members were hesitant to support a parking structure. “The idea of spending another million dollars on parking does give me some heartburn,” said URA board member Perri Gardner, noting the URA purchased another parking lot in 2016, just a few blocks away. Kickback Points has already signed a letter of intent to lease office space in the new building for about 50 employees. The city-owned parking lot behind the former Idaho Youth Ranch has about 53 spaces, and the new structure would add another seven spaces, with options to expand vertically. Board member Suzzane Cawthra questioned whether it was the URA’s responsibility to subsidize parking for a business. But Twin Falls City Council liaison Nikki Boyd said she favored a parking garage because it provided a singular place for parking, instead of spacing cars out more into adjacent streets. Residents at the meeting seemed more concerned about tearing down a historic building, which housed the county courthouse from 1907 to 1910. It was also a place where people remembered shopping as children. But on a recent tour of the building, she lamented how it had changed a lot over the years. An engineer had even told Murray off-the-cuff, “If it was me, I’d tear it down.” And Realtor Fran Florence believed the building couldn’t withstand the necessary modifications for an attractive housing project. The URA purchased the Idaho Youth Ranch building for about a half-million dollars this year with the goal of bringing more housing downtown. The other proposal the agency considered was from Kyle Miller with Paramount Property Development in St. Louis. Miller’s proposed $1.8 million historic remodel would have brought in a restaurant, a retailer and 10 apartments. After the meeting, Miller told the Times-News he plans to move to Idaho and will continue looking for other projects. In the end, the URA board hoped the joint proposal would bring it more bang for its buck. The former thrift store building stands at a major intersection of downtown that’s had significant public and private investment in the past year. Not only does it fall within the new Main Avenue streetscape project, but it is kitty-corner to the new City Hall and adjacent to a future downtown commons plaza with a splash pad. Also next to the plaza is Debra Gates’ building, which is being remodeled and will eventually host a restaurant. “I do feel this is one of the premier corners on Main Street, and I feel we should treat it as such by putting a bigger investment here,” URA board member Rudy Ashenbrener said.